Yesterday, I gave my ISTE 2014 Ignite talk in front of a few thousand of my closest friends and many more who were watching remotely. Though the experience was certainly terrifying, I am really glad I did it and the positive response to my message has been wonderful. I'm including the transcript of what I had planned to say below. I know it didn't come out exactly as written. In the interest of time I had to cut one of my favorite lines, but it was also the one I stumbled on most in rehearsal, so I think I was meant to let it go. It was, "Yes, many of my predictions are my own hopes carved into prophecies by raw optimism." As teachers we should predict the future, but we also have an influence in shaping it. Hello, I’m Jen Roberts. I teach high school English with 1:1 laptops in San Diego. But before I taught high school, and way before my students had laptops, I taught 7th grade, and Edgar was one of my students. When I taught Edgar and his classmates in 1999, dry erase boards were the latest technology, and my teacher computer weighed 60 pounds. But outside our classroom, Google was getting started, people were beginning to buy small computers called laptops, and Wifi was on the horizon. Today, Edgar is a computer professional. I know because he is the webmaster at my son’s preschool. The job he does today did not exist when he was in my class. When I run into Edgar, I get a fresh reminder that we are preparing our students for their futures. As teachers, we should be futurists. That’s the nature of the business. And predicting that future is not just our prerogative; it’s our obligation. Of course, our predictions won’t be right all the time, or even most of the time, but that’s not the point. Predicting the future is not about being perfect or even specific. It’s about being open to possibility. You will be wrong, but by how much? If I predict that my children will own electric, self driving, cars by the time they are 25 I might be right. I’m just extrapolating on existing data. It could happen. If I predict that in ten years schools will have 100 times the bandwidth they have now, I might be wrong. But what if I’m right? In 1964 Isaac Asimov predicted that phone calls would become video calls by 2014. He was right! What comes after video calls? Imagine the possibilities for learning and human interaction. And field trips are going to be a whole lot more interesting. Virtual Reality Headsets will let you take your class on a virtual field trip to any place in the universe and any point in time. The price point on these will come down to the point that every school can have a cart of VR headsets. I predict that wearable tech is coming to our classrooms, where it will initially be banned and then eventually accepted. Who would have guessed in 1988 that we would all be carrying cell phones today? Google Glass and others will become just as ubiquitous as cell phones have. What else is coming? In 2013 I stepped into a 3D cave and an undergraduate at UCSD walked us through a hemoglobin cell. She estimated the setup cost about 1 million dollars. But a mass produced version of a 3D pod could be commercially available to schools for a fraction of that cost. And I want one. As we move into an era where the common core is reshaping curriculum and 1:1 programs are putting a device on every student’s desk, I’m concerned that we will see a growing tension between corporations who want to package and deliver content, and educators who want to create collaborative, productive spaces, for children to grow. I’ worried that the next educational divide will be between the students who have the privileges and autonomy to determine their own learning and those who don’t. I predict that climate change will impact our kids lives. But, It will also drive innovation as we adapt. It will become a wedge issue in politics because there is no compromise that will stop weather patterns from changing and sea levels from rising. Our students must be prepared to change and innovate to survive. They will need to make hard decisions when they choose who to vote for and where to live. I predict that our world will become even more connected, driving the pace of innovation even faster. Students who are ready to join a connected community of innovators will have an exponential impact on the accelerated change coming in the rest of this century. Being a part of a connected classroom community and connecting across the globe with other classrooms is a good way to get started. Yes, many of my predictions are my own hopes carved into prophecies by raw optimism. I have prophetic dreams, not the kind that show me the future while I am sleeping, but the kind that tell me that innovation and education are a human rights. These are the dreams that tell me we can leverage technology to awaken the curiosity in our students and engage them in positive change. Our students are going to be living in the future for the next one hundred years. Predicting what that world will look like is not hard, and preparing them for it is the challenge we’ve already accepted. I predict that many of you will tweet me your predictions for your students. I hope I’m right. 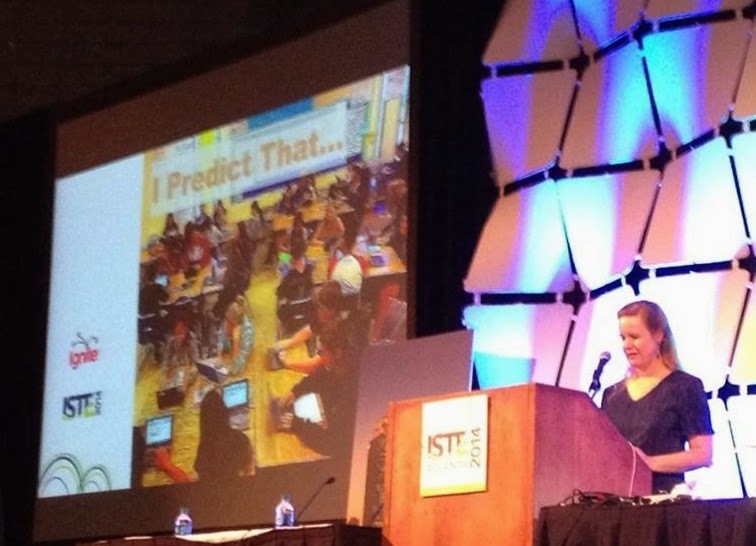 And by the way, I predict that ISTE 20-14 is going to be fabulous.